World copralite expert, Karen Chin, reports (Nature Vol.393 18th June 1998. p.680) the recent discovery of one 42 cm (17�) long copralite, (size 2.4 litres), in a bentonitic mud stone 35km south east of the town of East End in Saskatchewan, Canada. The copralite contains the broken bone of a baby dinosaur which seems to have been chewed. T.Rex is the nearest, largest Dino skeleton (about 35 km away) so the dung is attributed to T.Rex. Australian Director of Creation Research, John Mackay, has been to this site and several things are immediately evident. 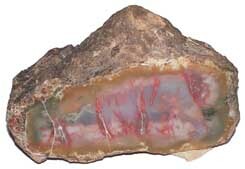 (1) It was found in a sedimentary layer. (2) These sedimentary layers are extensive. (3) The beds contain dinosaurs, as well as turtles and sharks� teeth. The copralite (and bones) were preserved because they were covered by mud from a flood. Bentonite is usually derived from volcanic ash - more evidence of massive catastrophism across Saskatchewan. Most dinosaur copralites show traces of coming from plant eaters. This ought not to surprise us as God created all creatures to originally eat plants (Genesis 1:30). In that first world there was no death by violence. Creatures did not eat each other. That was why He described the world as good (Genesis 1:31). Only after man sinned and death came into the world, were animals afflicted by sin. By the time of Noah�s flood there were creatures who ate the bodies of dead creatures. They are described as unclean (Genesis 7:2). After the flood, Noah was given permission to eat meat and man began to kill other creatures. From that time other creatures also began to develop carnivorous habits which shows up in their droppings. The earth is not covered with piles of such dung because of creatures such as Dung Beetles which make use of the dung and bury it. Dinosaur dung shows the same effects from Dung Beetles as present day droppings (look for their scratches and burrows in your specimen). Copralites are evidence that Dung Beetles have not evolved since the time of the dinosaurs, and reminds us that God thought out his creation very well - preparing Dung Beetles to prevent the earth being covered by horrendous quantities of Dino Do - up to three litres at a drop. The almost complete absence of large numbers of carnivorous dinosaur copralites, compared with the large number of herbivorous copralites, and the rare finding of juvenile bones in flood deposited dinosaur droppings, certainly fits the Biblical picture of the history of animal diet up to Noah�s day.